Being timely is just the tip of the promotion iceberg. There are several tools and creative ways to get your post read by the audience you’re targeting. Start with a killer title. Like a great subject line, your post’s title has got to grab a reader and draw them in right away. Experiment with titles that do a few important things: convey what the post is about in specific terms; respect the reader’s intelligence (don’t overpromise) and have some fun with language. This means using simple, but strong words like “love,” “hate,” “best” and “worst” or a personal favorite, alliteration (“Six Steps,” “Better Bylines”). And here’s a fun fact, according to HubSpot — titles with the word “who” generated a 22% higher CTR than headlines without it. We also like to consult use BuzzSumo to see what the most shared content is for our keywords and determine any tweaks. Experiment with different social platforms. As soon as a post is complete, make a habit of tweeting it, posting to Facebook, LinkedIn, and your other channels. Obviously, you want to prioritize social media sites frequented by your target audience, but don’t discount the less popular platforms where you may be able to spark additional interest. Then see what the analytics show. Different posts may fare better on different platforms, and the way in which you post on a platform may matter as well. For example, although we sometimes attract more views on LinkedIn by sharing our posts via the “Write an article” function vs. “Share an update,” experts are divided on whether publishing as an article violates the duplicate content rule and adversely affects SEO. Suffice to say that each platform offers different opportunities, and it pays to experiment. Forge relationships with other bloggers in your space. Everyone appreciates well-written, shareable content. Reach out to other bloggers in your space by commenting on posts you enjoyed and sharing them with your followers. This encourages reciprocal behavior. We advocate for a smart commenting strategy, making sure to post only if you have something legit to add. It’s also advisable to demonstrate authority by participating in influential communities in social media, offering genuine help instead of just promoting your own posts. Ideally, you each amplify the other’s work and expose new readers to your content. And, think broadly here, reach out to competing sites and influencers, as well as social communities and forums with potential interest in your content. Check out bloggers you admire who also have podcasts or newsletters looking for content. Use analytics as a guide for content. Steven Levitt, Co-author of Freakonomics once said “Data, I think, is one of the most powerful mechanisms for telling stories. I take a huge pile of data and I try to get it to tell stories.” This may sound counterintuitive, but we recommend a version of this approach when deciding what to tell readers in our own bi-weekly blog posts. We look at our page performance dashboard to show us which topics attracted visits, and by whom. This way we can build on those top-performing posts, delving further into a topic or spinning out in new directions. Rework or update your top posts periodically. Following the above, we also find success in simply updating or refreshing a post that caught fire with our readers. This works especially well with “hits and misses,” annual lists and other seasonal posts as well. A simple tweak refreshes a tried and true topic. For years we crafted Thanksgiving posts based on what PR should be thankful for but that started to seem redundant. This past year we turned our “thankful” post into a “roast” of PR “turkeys,” – mishandled communication opportunities, bad pitches, and so forth. A fun topic like this is also easy to promote given the visuals and endless plays on words. For list posts, we recommend keeping a file of applicable stories so you aren’t scrambling when it comes time to create the post. Older posts can also be repurposed when trending news makes them relevant again. It seems there can never be too many posts about bad airline PR, for example. Advertise your post. 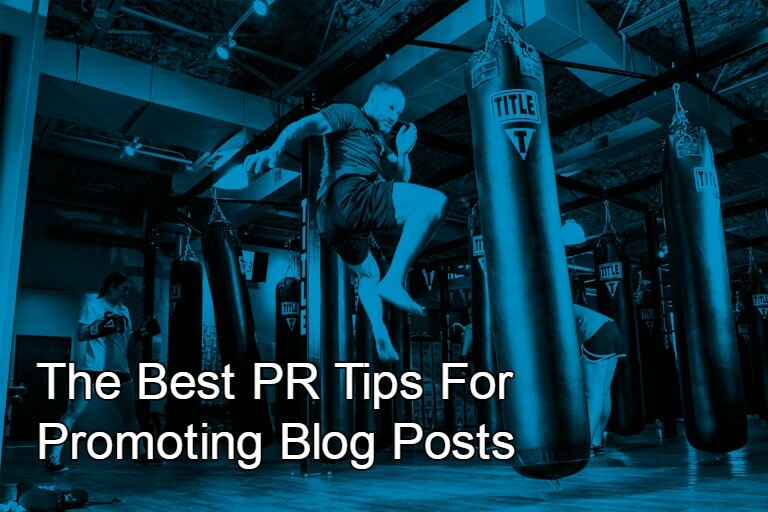 There’s no shortage of paid opportunities to promote a company blog. Typically the spend is relatively inexpensive, so testing a paid strategy might be very accessible. Facebook Ads offers an easy interface and a Facebook Ads Manager tool to set objectives. On Twitter, consider the Promoted Tweets option, which offers the opportunity to target people based on who/what they follow and what has been shared on their profile and in their feeds. Twitter also allows you to buy tweets through services like JustRetweet. Before going down the paid route to promote your blog, we recommend thoroughly researching the options and setting a budget. Finally, there are some quick and easy promotion techniques that should become part of your blogging strategy. If you haven’t already done so, link your signature to your blog posts. Consider e-mailing posts to a receptive audience such as frequent contacts or newsletter opt-ins. Don’t spam a bunch of reporters or new business prospects. In its research, TrackMaven also found it best to avoid publishing on Wednesdays (very competitive) or Fridays (fewer eyeballs). Yet, the site claims blog posts published on Sundays receive the highest average number of shares per post. The benefits of blogging for driving visibility, building reputation, and conveying expertise are significant. Blogs drive traffic to websites, establish authority and help generate leads. Make the most of each post by ensuring that the right people are reading it. Promoting a blog post is just an art, like writing a post is an art, and I personally believe we should experiment a lot with this, it can help us improve and refine the art, that can bring lots of success.